« Older: Kelly McGuire celebrates birthday in San Pedro! The environmental community in Belize has weighed in and condemned the catch of two highly vulnerable marine species that are considered critically endangered next to extinction and endangered respectively. A Goliath grouper (Epinephelus itajara) and a Scalloped Hammerhead shark (Sphyrna lewini) were both caught in Belize in two separate areas, but it brings into sharp focus the country’s fishing regulations. 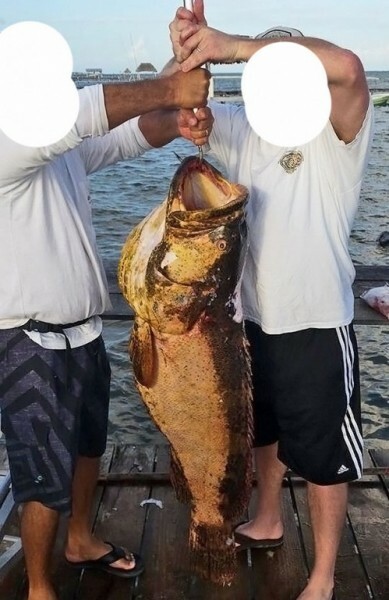 In the case of the Goliath grouper, the large fish was caught off of the Turneffe Atolls by a local tour guide from Ambergris Caye. 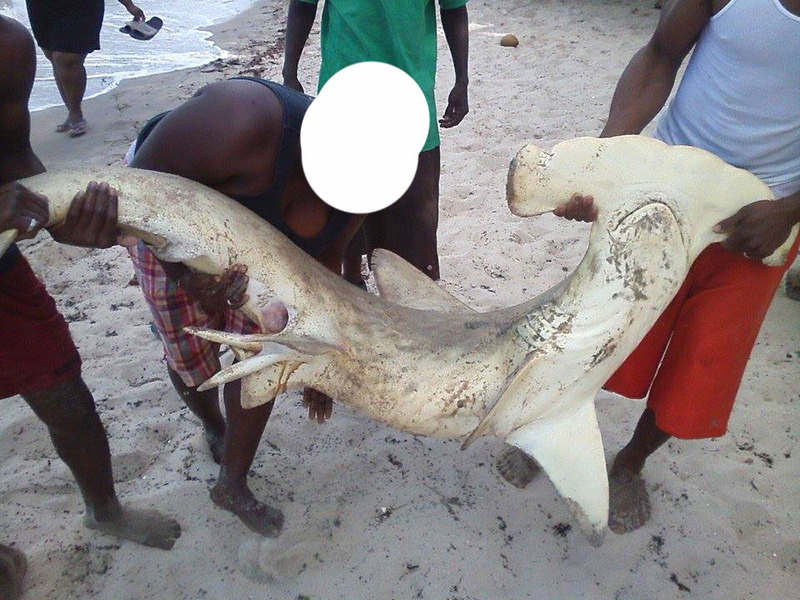 The Scalloped Hammerhead shark was caught in shallow waters by fishermen from Hopkins Village in the Stann Creek District. 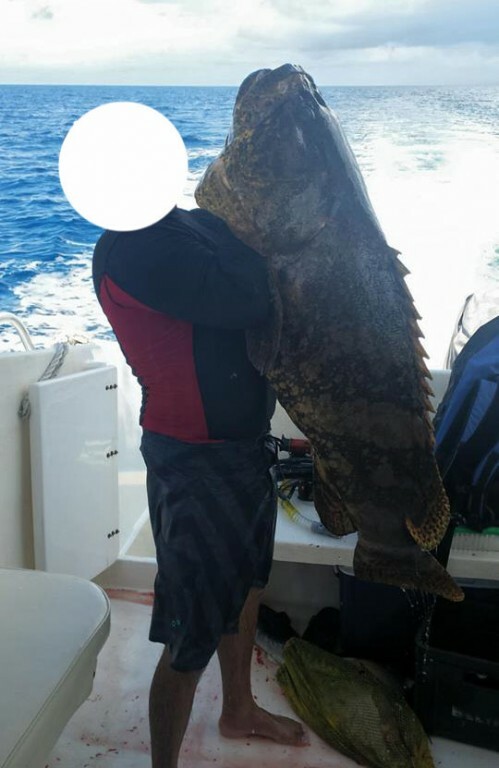 Pictures showing the Goliath grouper, over four feet in size, were posted on social media, in which the guide and tourists claimed that it was speared near Turneffe Atolls. According to Biologist Dr Rachael Graham of MarAlliance, the Goliath grouper population has been critically threatened, and that alone should discourage guides from fishing them. “Goliath grouper are listed as Critically Endangered to Extinction globally by the International Union for Conservation and Nature (IUCN). Their populations have plummeted throughout their broad distributional range in the Gulf of Mexico, Caribbean and Atlantic due to their site fidelity, predictability and curiosity - which makes them great spear fishing targets,” said Graham who has conducted long term research on these species in Belize. To prove her argument, Graham stated that there are only three remaining populations that have been monitored to the degree in which researchers are able to understand population structure, vulnerability and movements. Two of the three protected areas are in the US, one of which is known as a spectacular spawning aggregation site. The third area is in Brazil. “In Belize, between 2005 and 2010, in our long-term study, we primarily registered juveniles (smaller than 110 to 120 cm) mostly in southern Belize - due to high incidence of red mangrove to which this species is strongly associated. We have never captured or identified a fisheries-related landed individual with roe. We have recorded through a long term tagging program that the animals tagged in Port Honduras move to Honduras, Guatemala, Mexico, and multiple sites within Belize…fish longer than 55cm in length accumulate toxic levels of methyl mercury which, once accumulated in our bodies is not eliminated and will cause mental impairment and more,” explained Graham. Equally disturbing for ocean conservationists in Belize is the use of gillnets. Gillnets are referred to as the ‘walls of death’ for marine species. The name proved right when a Scalloped Hammerhead shark was founded tangled and drowned in one in the Stann Creek District. The approximately eight-foot in size hammerhead swam into a net placed in the shallow waters on the north end of the Hopkins village. By the time the fisherman pulled up his net on Sunday, February 15th, the shark had already drowned. “The Scalloped Hammerhead is today classified as a species endangered with extinction. Globally, it is estimated that in the last 30 years, the population of Scalloped Hammerhead sharks has declined by more than 95%. Known as ‘walls of death,’ destructive gear such as gillnets and activities such as finning contribute to this staggering reality faced by shark species like the Scalloped Hammerhead,” stated a release from Oceana in Belize. For Janelle Chanona, Oceana in Belize Vice President, not only is the sighting of Scalloped Hammerheads rare in Belize, but to be caught dead in a gillnet brings to light the importance of moving away from gillnet fishing since it affects non-targeted species. “Since 2009, Oceana in Belize has been working to support a call made by fishermen in both the commercial and sport fishing sectors to ban gillnet fishing. Gillnets are very indiscriminate in that no matter what the species is, once you get into that net, it is a sure death sentence. The incident goes to show that if we don’t get rid of this destructive gear, creatures that are sometimes special and rare like the Scalloped Hammerhead will meet its death,” said Chanona. According to Chanona, gillnets are one of the main causes for regional extinction of species such as the sawfish and other non-targeted species that feed on smaller fish. Gillnets are regulated in Belize and fishermen are required to license them in accordance with the Fisheries Act. However because of the lack of proper policing, it is uncertain how many gillnets are being used countrywide. “There is a lack of enforcement. There are all these rules but there is nobody going out to check to see if they are being followed. For that reason, a ban was initiated way back in 1997. So we again call on government to take a stand on this issue by asking for a legal transition away from gillnets. Sports fishermen also support the ban given the regional experience of collapse of economically important fish stocks. From a sustainable management angle, and an economic standpoint, gillnets have no place in Belizean waters. A ban of this gear is an important step towards responsible fishing methods,” Chanona pointed out. The unfortunate catches, even though isolated, summarize the need to support encounter tourism and the ban on gillnets and fishing of threatened species. Both organizations believe that it will take collective efforts to bring decision makers to a common understanding that if the use of gillnets and the fishing of threatened species continues, it can have catastrophic consequences on the fisheries population and the marine-ecosystem.